“Plan ahead and have time to explore the most important historic places, enjoy delicious meals, and learn the importance of our Ancient city” America’s oldest city is home to centuries of history, soft sandy beaches and a host of fun and interesting attractions. And you can see all of St. Augustine in 2 days aboard the Old Town Trolley! If you’ve never been to St. Augustine, you’re in for a fun-filled, fascinating experience; Old Town Trolley Tours makes 23 stops and includes about 100 different sights. If you plan ahead, you’ll have time to explore many of the most important historic places, enjoy delicious meals, and learn the importance of our Ancient city. The first stop on the St. Augustine tour is at the Old Jail, the History Museum, the Oldest Store Museum Experience and Gator Bob’s Trading Post. If you have kids or even if you don’t, hop off and take the 30 minutes to enjoy the Tour of the Old Jail. It’s a fun and entertaining look at this historic jail that was built in 1891 and the deputies and the sheriff make it even more amusing. Entrance to the St. Augustine History Museum is free with your Old Town Trolley ticket, so take a look around; you’ll only need a little time to see the cool artifacts and unpublished photographs from the city’s past. Stop #5 – The City Gates: Give yourself some time to walk down St. George Street. This is the city’s most popular street, a walking mall with many shops, restaurants and historic buildings including the oldest wooden schoolhouse. When you smell the fresh baked bread, you’ll know you’re in the right place for lunch – the Spanish Bakery is tucked away in the middle of St. George Street and is famous for their fresh loaves of bread, empanadas, smoked sausage and picadillo. You’ll also want to grab a homemade lemon, almond or cinnamon cookie. Ripley’s Believe It or Not is also right here. Give yourself a few hours to see everything in this area – more if you enjoy shopping. Stop #9 – The Churches of St. Augustine: Visit the Flagler Memorial Presbyterian Church; Henry Flagler, his daughter, and first wife are buried there. You’ll also able to view the Ancient City Baptist Church and the Grace United Methodist Church – all stunning icons. 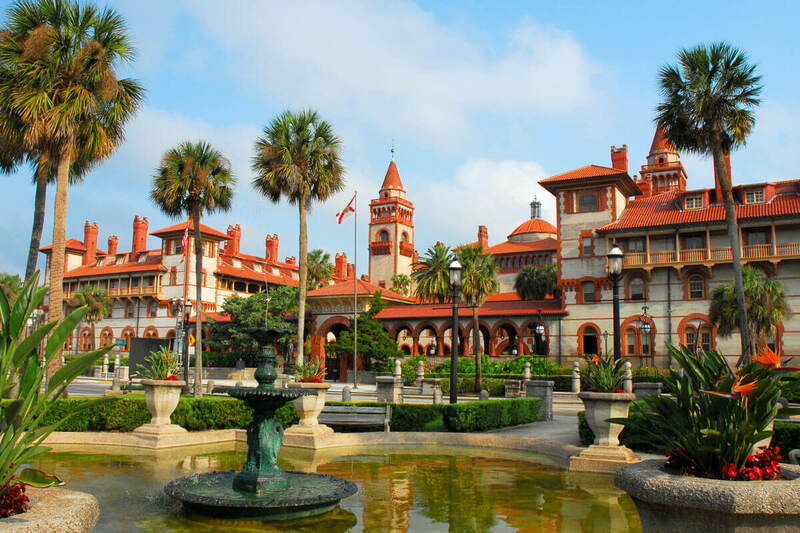 Also close to stop #9 is probably the most famous attraction in the city, Flagler College. You’ll enjoy spending the early afternoon between these St. Augustine attractions and then finish your day at stops #13 and #14 where the San Sebastian Winery and Whetstones Chocolate Factory are located. What better way to end the day than with a nice glass of wine and some homemade chocolate to top it off! 9:00am Start: Head to the trolley stop that’s closest to your hotel, but keep in mind that you want to get on before stop #10. Here you’ll have the opportunity to take a tour of the Villa Zorayda, a striking Spanish Revival building. Also in this area are Flagler College and the Lightner Museum, both renowned architectural masterpieces built by Henry Flagler. Stops #15 & #16 – Exclusive to Old Town Trolley: This part of the tour will give you a variety of sites to see and you’ll want to spend about 2-3 hours between the two areas. You’ll also be able to grab lunch around this area with a variety of restaurants to choose from. Attractions include: Potter’s Wax Museum, The Spanish Military Hospital, Ancient Ximenez-Fatio House, Plaza de la Constitution & Cathedral Basilica. At this point, you may also want to jump on the free Beach Bus and head over to the Alligator Farm – this is a great outing for the family. Give yourself at least an hour to walk through to see all the alligators and other animals. Stop #18 – Castillo de San Marcos: Give yourself an hour or two and view the Castillo de San Marcos. This massive historic fort is the oldest remaining European fort in the United States and a definite must see while you’re in St. Augustine. At the end of the day, visit the Fountain of Youth at Stop #23 and rejuvenate your soul! 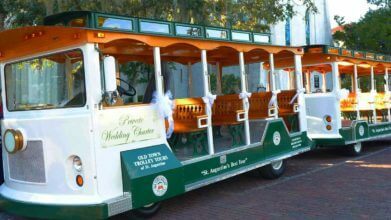 Just two days on the Old Town Trolley and you’ll be delighted that you’ve seen the best of St. Augustine!